When you think of must eat foods in Japan you probably think of expensive Kobe beef, Michelin-Star ramen, sushi made by Jiro himself, and 7-Eleven? Yes, you read that right. You might be asking yourself, why would I want to eat at 7-Eleven on my visit to Japan? The answer is because the food is delicious and affordable. This isn’t your typical 7-Eleven in America. And, don’t get me started on the variety of options available at each store. It is mind-boggling. There is something for everyone. This might sound strange for first time visitors to Japan, but trust me, you will want to try some of the foods at a Japanese 7-Eleven. Here is a list of some of the must try items at 7-Eleven in Japan. 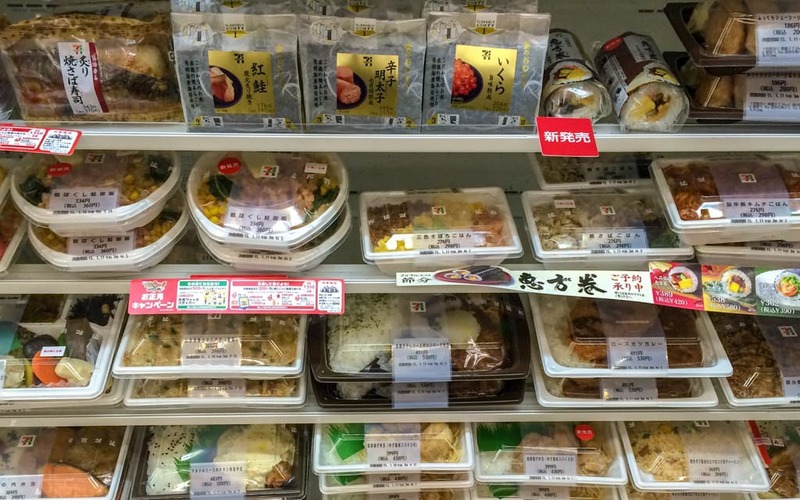 This is an every growing list of what to eat at 7-Eleven in Japan. This list will update over time as I sample more delicious goodies at 7-Eleven Prices may vary by location and will be accurate at the time of posting. This list was last updated on March 19, 2019. One of the cheaper food options found at 7-Eleven in Japan would have to be the Pork Dumplings (230 yen or about $2.06) served with soy sauce and chili oil. I was expecting some of the dumplings to by dry but this was not the case. The skins were thick, tender, and chewy which I enjoyed. While it appeared the dumplings were quickly pan fried, I wasn’t getting much of a smoky flavor in each bite. I did find each dumpling to be on the salty side though. Also, the skins were oily which you may or may not enjoy. Stuffed inside each dumpling was a mixture of pork and minced green onions. There was more pork stuffed inside than I was expecting. The pork, while juicy and tender, which was unexpected, lacked a lot of flavor. Once again, the pork was salty. The green onions added a much needed crunchy texture to each dumpling and helped cut through the saltiness and richness. Don’t forget a quick dip in the soy sauce and chili oil. I really enjoyed the rich chili oil which packed more heat than expected. If you are in the mood for something hearty and filling, then the Pork Cutlet Curry Bowl (540 yen or about $4.85) might do the trick. There were two parts to this bowl: a sliced pork cutlet which was doused in a curry sauce and a portion of white rice. While I poured the pork cutlet and sauce over the white rice, you can eat it however you like. Any chance of a crunchy crust was lost the moment the pork was covered in the curry sauce. I wouldn’t say the crust was soggy but it just didn’t have much texture to it. I thought the cutlet was cooked well considering it was microwaved in a plastic bowl at 7-Eleven. It was just the right thickness though not as meaty as the pork cutlet sandwich. While the pork was leaner than I was hoping, and didn’t melt in my mouth, I found the texture to be tender with a good solid bite to it. Think chewy but easy to bite through. Just look at the thick layer of brown curry sauce slathered all over the sliced pork cutlet. It was beautiful. I could smell the sauce even before I took the plastic wrapping off of the bowl. I loved how rich the sauce was. It was sweet and salty with a hint of heat. Each and every bite had a distinct Japanese curry taste. All the flavors and aromas of the curry infused into the pork and rice below. The sauce mixed with the simple white rice was delicious. I couldn’t stop eating it. This pork cutlet curry bowl was satisfying and hit the spot. I bet it would taste ever better after a long night of drinking beer and sake. One of my favorite items found at 7-Eleven in Japan would have to be none other than the Pork Cutlet Sandwich (358 yen or about $3.21). In this sandwich you had a thick piece of pork cutlet, sliced cabbage, cutlet sauce, and mayonnaise all placed between two pieces of white bread. Just look at that thick piece of pork cutlet. It was meaty and beautiful. The pork was much more tender than I was expecting. While the cutlet had a bit of texture and bite to it, I was surprised how easily I could chew through it. The pork was on the leaner side but still packed a lot of flavor. There were no stringy, chewy, fatty bits to be found. For the price, I really couldn’t complain. Coating the entire pork, and part of the white bread, was a layer of brown cutlet sauce. While thin, the salty and sweet sauce added not only an umami competent to the sandwich but added moisture to each bite. Without the sauce the cutlet and bread would have been too dry. There was also a light coating of mayonnaise. The rich mayo complimented the sweet and savory cutlet sauce. You can’t have a pork cutlet without sliced cabbage. The cabbage found in this sandwich was sliced very thin, almost unnoticeable. While crispy and fresh, I just wish there was more of it or if it was sliced thicker. I can’t forget about the white bread. If you grew up eating wonder bread then this will be all too familiar for you. The bread was simple but oh so light and fluffy. Like pillows of bread. It was divine when the bread soaked up the flavors of the pork, the cutlet sauce, and the mayonnaise.